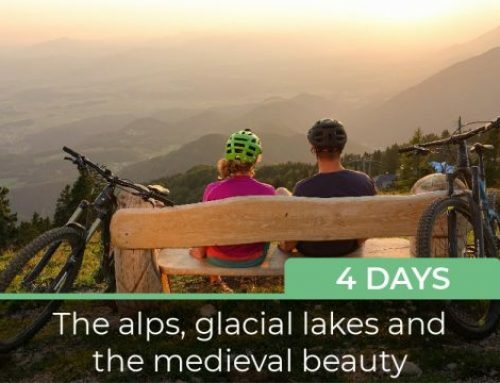 One of the most beautiful and scenic cycling routes in the Gorenjska region runs through the shady forests and open grassy terrain at the foot of the south slope of Košuta, Slovenia’s longest mountain. English and German speaking guide. A walk through the town center of Tržič. Visit of the Dovžan gorge. 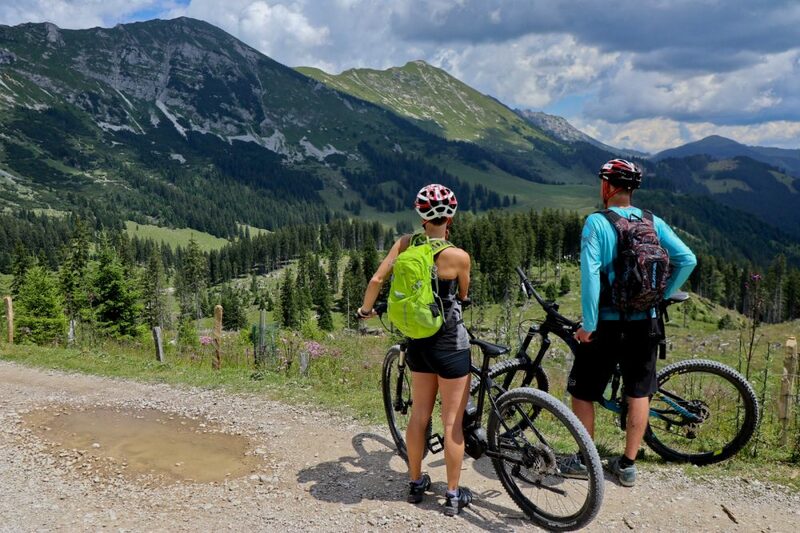 Enjoying endless views of the Karawanks. Easy cycling without longer climbs. A basic physical condition is required to deal with the distance for at least 2 hours. 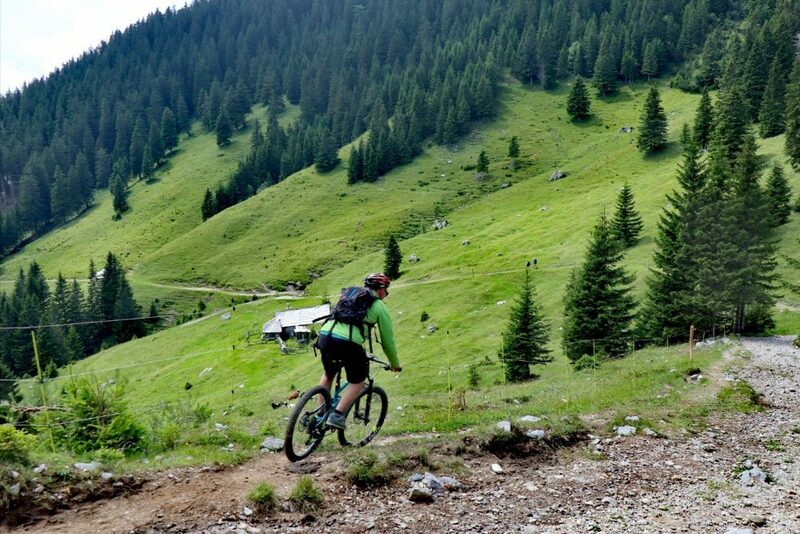 Easy cycling on a more rugged terrain with occasional longer climb. Casual fitness is enough. Cycling on a more dynamic terrain with longer climbs. Regular activity fitness is required to deal with the distance for 5 or 6 hours. All-day cycling on a dynamic terrain with longer climbs. Good physical condition is required. Advanced cycling includes a long distance and high difference in altitude, with longer climbs and descents. Very good physical condition is required. For novice cyclists that are just beginning with the sport, or cycle occasionally to relax. Paths are usually straight and paved. Occasional cyclists with some degree of technical skill. Paths are mostly macadam, with some intermittent forest paths and moderately difficult sections. Regular cyclists with good technical skills. Mostly forest paths and mountain tracks with plethora of technically more difficult sections. Cyclists that spend a lot of their time on a bike and are extremely well versed. They conquer all difficult sections without breaking a sweat. 9.00 am – Pick up location: The tour starts at your accommodation. From where we will take a ride to Tržič, which will be our starting point of the cycling part of the tour. 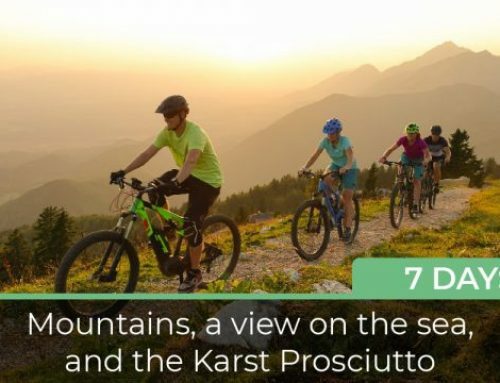 10.00 am – Route start: The first part will consist of an medium uphill ride through lovely Dovžan gorge all the way up the river Tržiška Bistrica. At the end of the valley we start to climb uphill to the mountain pastures of Košuta. 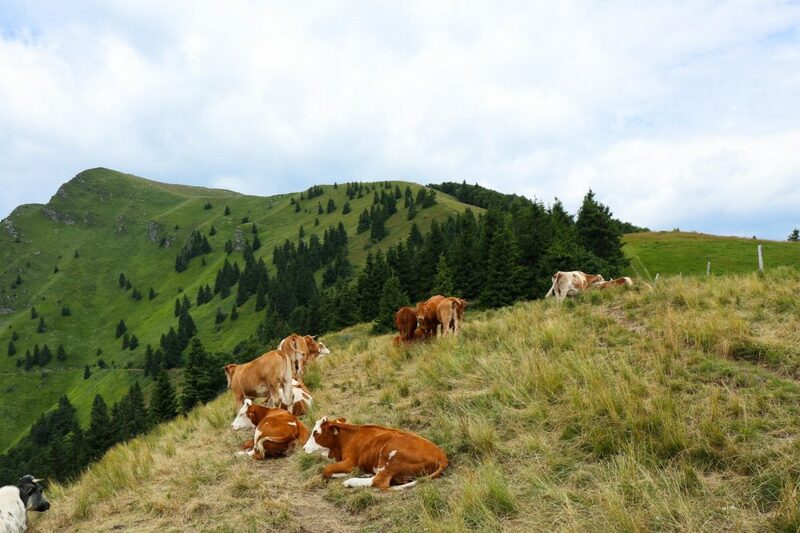 We will pass mountain pasture Pungrat and Šija where we will take a longer rest, to refill our lungs with all the clear mountain air and rest our eyes on the beautiful panorama view. 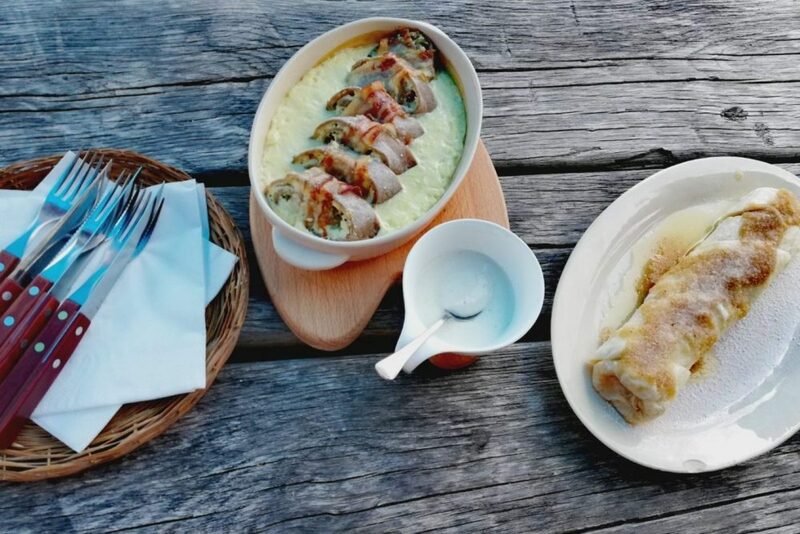 Šija will be the highest point of our tour, and scouts hut is a perfect place to try some local cuisine. After we will follow the path to pasture Kofce, where we get ready for downhill ride back to the valley and town of Tržič. 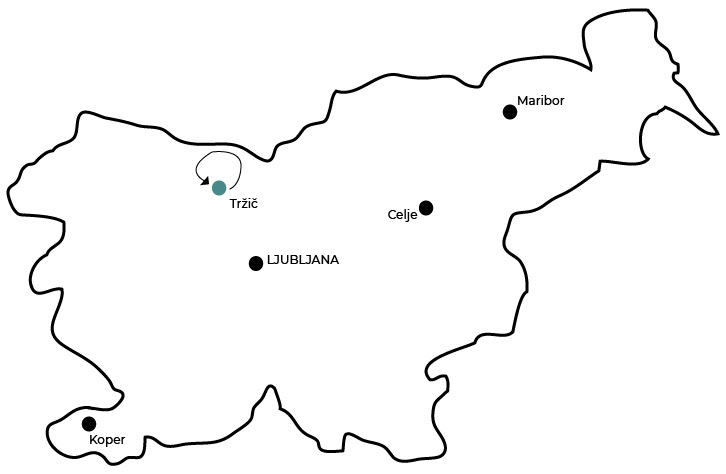 4.30 pm – Route finish: We will conclude our trip in the town of Tržič. Before we take you back to your accommodation, we will have an afternoon coffee and an ice cream on the main square of Tržič. 6.00 pm – Drop off: A trip back to your accommodation. The Dovžan gorge is a journey through time. Although it is older than the dinosaurs, no dinosaur ever trod here. They did, however, swim: 300 million years ago this place was the site of a tropical sea, teeming with marine animals. Today in the walls of the gorge we can see their fossilized remains in abundance, including some that are found nowhere else in the world. Bike equipment – Electric mountain bike and bike helmet. Exciting 6 hours long bike tour (time from pick up to drop off). A ride from pick up location to the starting point of the trip, and a ride back after the tour is concluded. Full support from our team. In case any technical issues occur, we’ll make sure everything is fixed. Upgrade to full suspension mountain bike. We had a great trip to planina Šija, with a fantastic team-very nice guides. 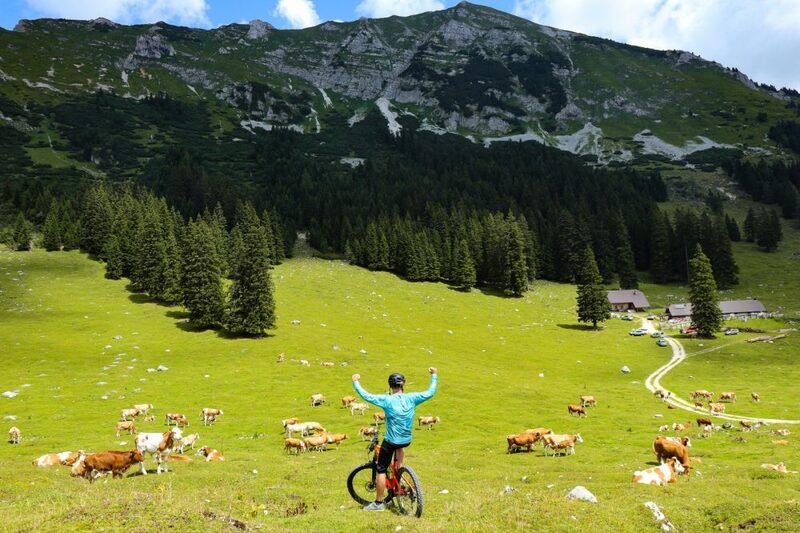 An exciting e-bike tour with breathtaking views from 1500m heights, down to the valley. I would recommend this kind of tours, not just only for the families, but also for teambuildings or a nice birthday present. What a crazy and fun ride. I loved it. Awesome ride around mountain area of Tržič! Jernej was great mentor, super nice and friendly . Cant’t wait to do it again. We had a bike tour on Šija with co-workers and we had a great time! Awsome experience for us. Beautiful views through the whole trip. Jernej and Jerca were very nice and friendly. I recommend it to everyone looking for a fun activity in nature. Thank you for such a wonderful day, team Greenhills! Since we believe smaller groups mean better experiences, we usually travel in groups of five to ten people. The minimal number of people for an individual group tour is four. We are also offering private tours. For more info please contact us info@greenhills.si. 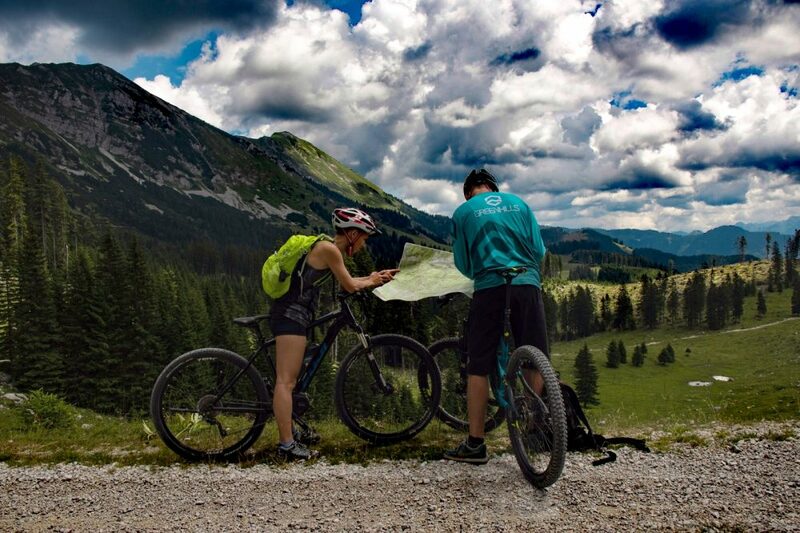 The tours are led by experienced cycling guides who know the tour locations like the back of their hands. They will be there for you with their experience and skills any time you’ll need them. They’ll try to make every tour more exciting with the right stories. 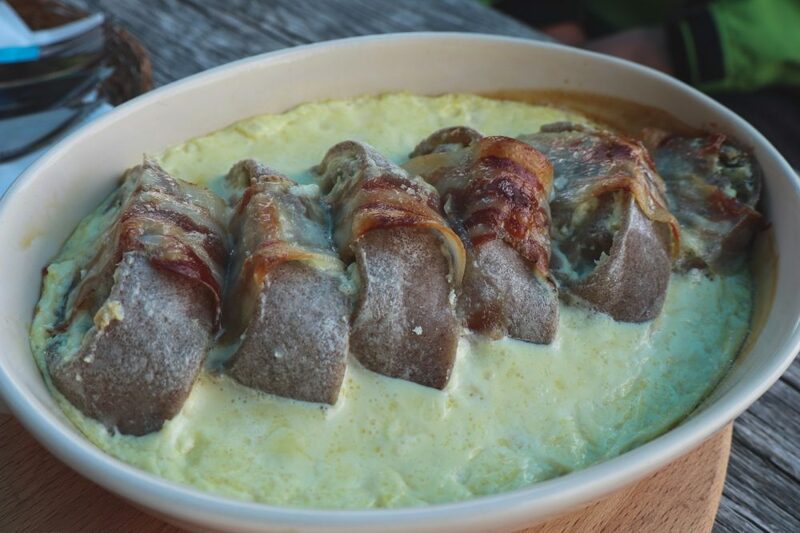 All of our tours are planed with stops, where we can find local culinary specialties. I’m not a PRO cyclist. Can I join? 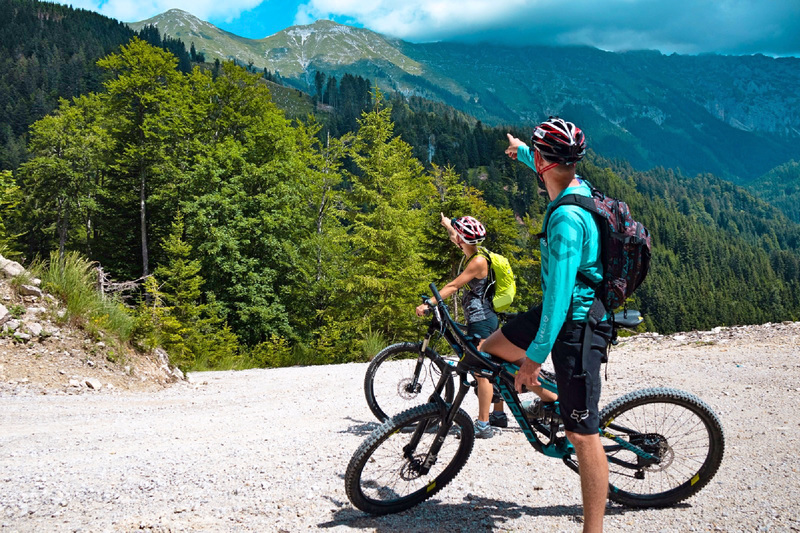 Our cycling tours are suitable both for those who cycle regularly and those who take a cycling trip occasionally. We use electric bikes on our tours to turn even the most difficult trips into an enjoyable journey for those with less stamina or technical skills. Plus, we adjust every tour to your skills and abilities. Most importantly, you should wear comfortable sports clothes. Please bring bottle of water and sun protection in summer months. We provide all the cycling gear (bikes, helmets, service first aid, …). Any additional gear or clothes can be stored in a van. Can we bring kids with us? Kids are also welcome, as long as they can cycle independently and can ride for at least 20 kilometers. Please notify us about any children joining when you book a tour. That way we can adjust the difficulty of the tour to them. What about the bad weather? Unfortunately, the weather is not up to us, so even the good plans might be ruined due to bad weather. We’ll make sure the tours happen even in less ideal weather, but we need to put your safety first. In case your tour gets cancelled due to bad weather, we’ll fully reimburse you. Wear comfortable sports clothes. You should also know some of the tours take place in the mountains where temperatures can change rapidly even during the summer. We suggest you bring warm clothes. You should also consider a waterproof jacket in case of bad weather. Guests ages 18 and up can attend. Parents may also bring children. If you bring a guest that’s under 18, it’s your responsibility to make sure the activities they participate in are age-appropriate. In case the guest cancels the tour order within 24 hours of purchase, full refund is issued. See cancellation policy. You can also reach us via Viber and WhatsApp.